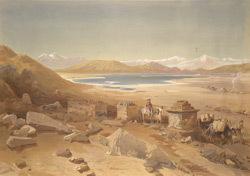 This chromolithograph is taken from plate 32 of William Simpson's 'India: Ancient and Modern'. There are hundreds of salt lakes in the northern plateaus of Tibet, including the highest salt lake in the world. Nomads made journeys to these remote waters cradled by snow peaks, returning with salt-laden yak caravans to barter the salt for grain. The salt in the water is natron, a sub-carbonate of soda, rendering the water completely unfit to drink. In the foreground of this print is a Tibetan Buddhist monument known as a 'mani'. The sacred, untranslatable mantra 'Om mani padme hum' is carved on to stone slabs placed on the top.